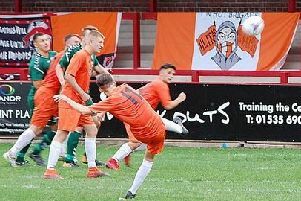 A youthful Blackpool side continued their unbeaten start to the Hallmark Security League season, inflicting a third straight defeat on Atherton. 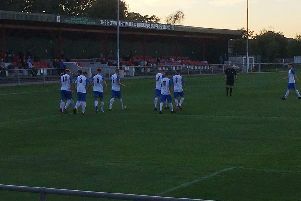 Four teenagers started the game for AFC, including 17-year-old debutant left-back George Thomason, in a side captained by Ben Fishwick in the absence of the injured Danny Pickering. The visitors started the stronger, creating a series of chances to score their first goal of the season. AFC keeper Alex Cameron was kept busy and was saved by the woodwork on one occasion. The hosts were mostly reduced to long-range efforts and Atherton must have felt unlucky to go in at the break all square. Blackpool looked much stronger in the second half as Conah Bishop shot wide. Manager Dave Worthington's double substitution midway through the half did the trick as both Carnan Dawson on the left and Ben Bradley up front were soon posing problems. It was man of the match Jack Williams who finally broke the deadlock in the 70th minute with a close-range finish following a goalmouth scramble. AFC could have scored more but for some fine saves by LR keeper Louis Murray, though they held on comfortably enough at 1-0 and stand fourth in division one north with seven points from three close games. On Saturday AFC are away to Steeton at Keighley Cougars RLFC. Places are available to supporters on the team coach,which leaves The Shovels at noon (contact 07714 3248872). Blackpool: Cameron, Taylor, Thomason, Caunce, Mottram, Hall, Baird, Fishwick, Williams, Finlayson, Bishop; subs; Betteridge, Dawson, Bradley, Broadstock.